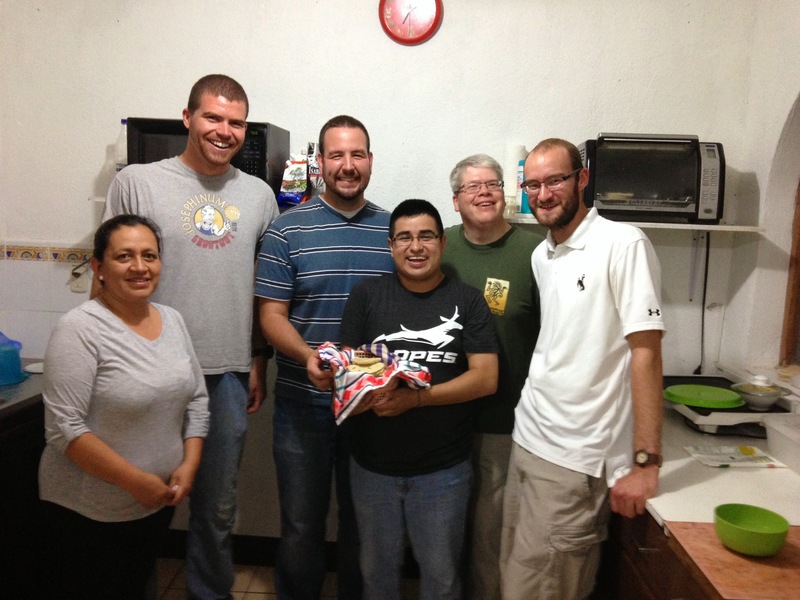 Wow, crazy how time flies, it’s already nearing the end of my third week here in Guatemala! My Spanish is progressing. In the moments it can feel frustrating as if I’m not making any progress but when I look at where I am now compared to where I was the first day, I am able to converse much more easily in Spanish and obviously am learning a lot. My teacher is incredible patient with me (¡Gracias a Dios!). 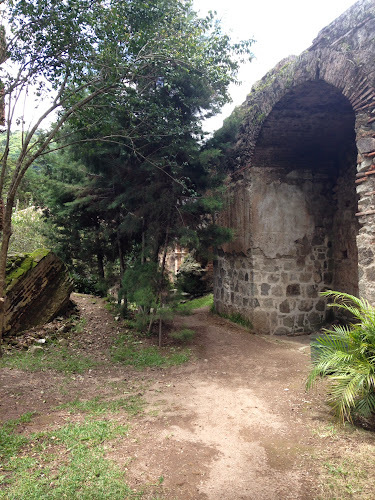 We have been slowly working our way through the nuances of Spanish grammer and in particularly we are working with the different verb tenses (for you grammer people out there: I have been working through the present, the preterite, and imperfect tenses so far). 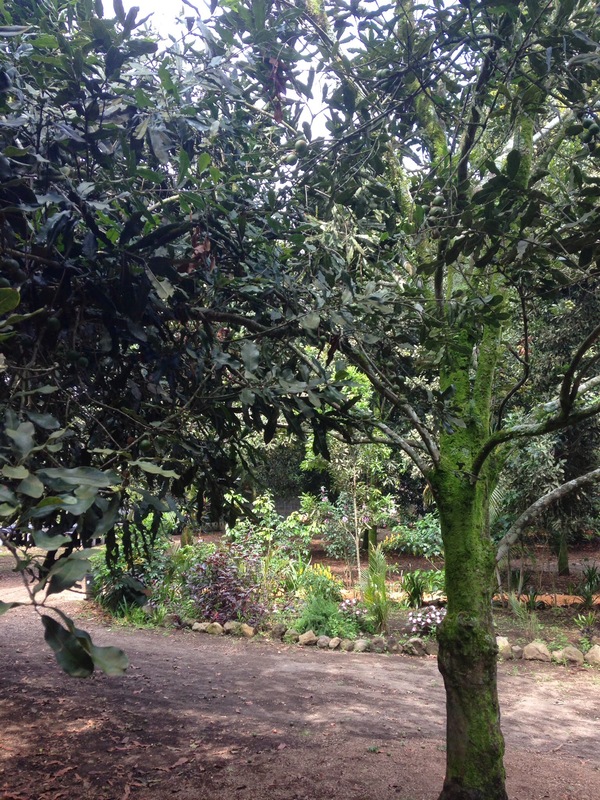 Last Wednesday we got to tour a macadamia nut farm, and got to sample them. All the nuts are picked by hand and they use incredibly simple machines to remove the shell, dry the nuts, and sort them. They then sell the nuts by themselves but also make a variety of other products (macadamia oil for your skin, macadamia nut butter, chocolate covered macadamia nuts, plus other foodstuff). Additionally they use macadamia nuts in making pancakes in their restaurant and top them with macadamia nut butter… and they were most certainly delicous (we, of course, had to try them!). On the 4th of July, we celebrated our Independence Day by having a fiesta at the school. 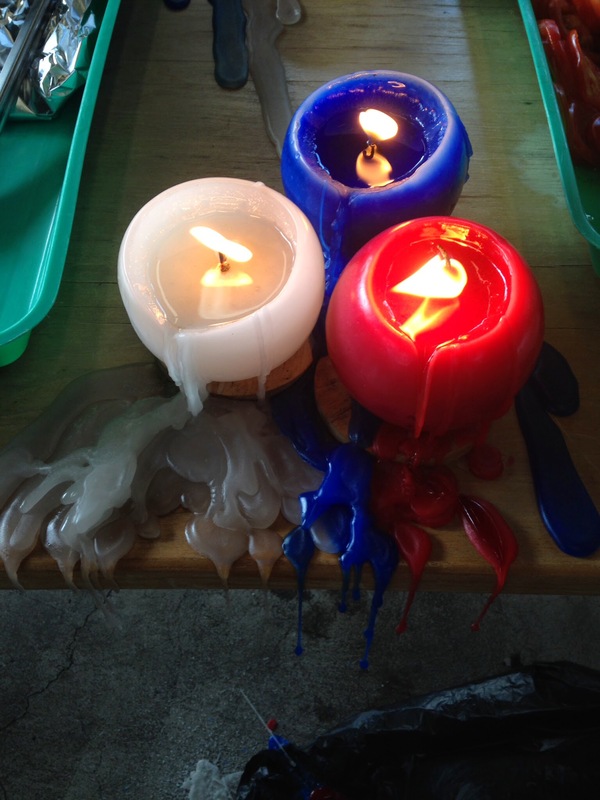 Beginning with our national anthem, a barbeque commenced. We gathered food that could be cooked like in the United States and ate hamburgers and hot dogs (turkey dogs…), plus baked beans, corn on the cob (elote), potato chips, and beer. It was probably the worst (healthwise for me) I’ve eaten since coming here to Guatemala, but it was delicious and a nice reminder of home. We also had a few bombas (fireworks that aren’t for viewing as much as they are for making a lot of noise – they are usually set off during the day) that we lighted in celebration. Practically just like being home. I also listened to “America” by Neil Diamond, a personal tradition of mine and a song that I love. Last weekend we stayed in Antigua again and wandered around the city, exploring more. We toured the ruins at the church of San Francisco and also went to Mass there. 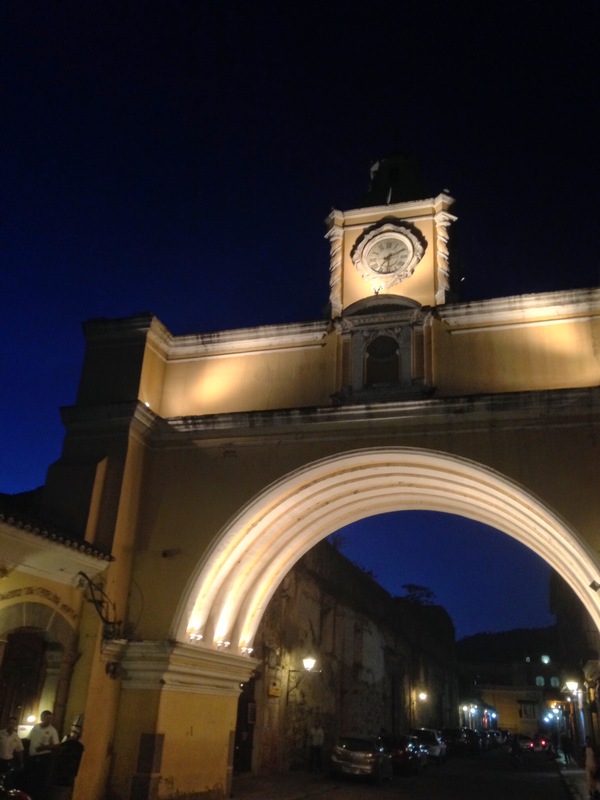 The famous arch in Antigua, at dusk. 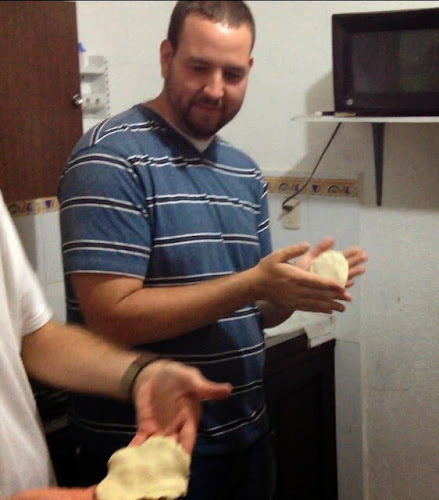 This week (along with learning more Spanish) has been even more awesome because we went to one of the family’s houses to learn how to make tortillas de maize. [Disclaimer: the tortillas weren’t made from scratch, but with a packet of Maseca, a pre-made corn flour mix]. 5 of us got our hands dirty and flattened the corn flour in our hands to make tortillas and helped Flory (the mom of the home) grill them slightly. Flory then taught me how to make guacamole (incredibly simple!). All I did was mix avocados with a little salt and some lime juice. 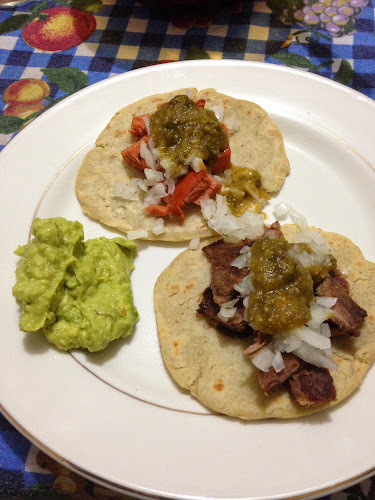 Flory cooked carne asada and chorizo and we all got to enjoy tacos with our homemade tortillas. ¡Muy delicioso! My incredible meal of homemade tortillas with chorizo & carne asada, onions, and salsa chiltepe. And guacamole! 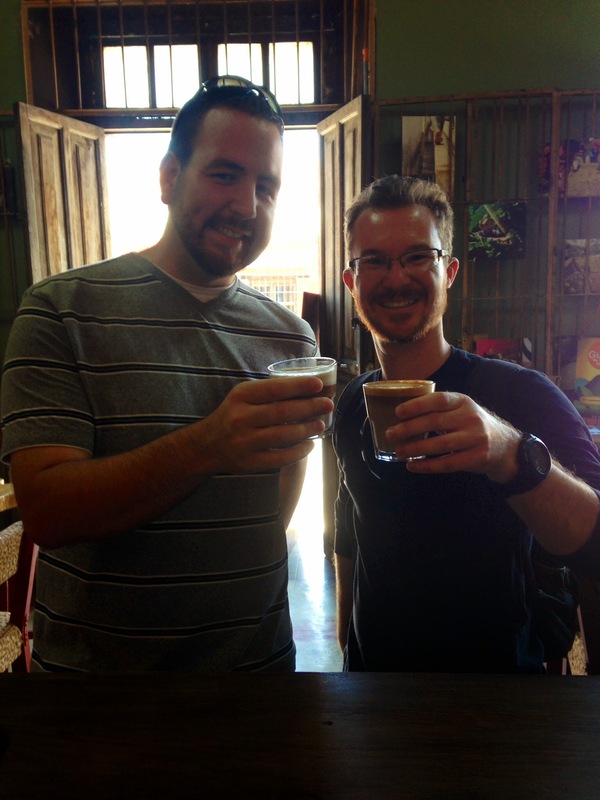 This week I was also blessed to share some incredible coffee (espresso mixed with Mayan chocolate) with a good seminarian friend of my from the Diocese of Orlando, FL, Mark LaBelle. He’s here in Guatemala learning Spanish as well, just at a different school. And so here’s to what God’s grace has in store for me during the next five weeks! Cheers! ← Geronimo! Guatemala, estamos aqui!